(Trent Nelson | The Salt Lake Tribune) Rachel Bell Belton at Kiitos Brewing, a 1-year-old Utah brewery that makes environmentally responsible beer. The craft brewer uses a High-Efficiency Brewing System, or HEBS, that uses 40 percent less water and 15 percent to 20 percent less grain. Thursday, July 26, 2018, in Salt Lake City. Drink Beer. Do Good. Give Thanks. It’s the motto at Salt Lake City’s Kiitos Brewing and what drives beer production at one of Utah’s most environmentally conscious and community-minded craft breweries. “We do everything we can to minimize our impact,” explained owner Andrew Dasenbrock. (Trent Nelson | The Salt Lake Tribune) Head brewer Clay Turnbow and Eddie Landa at Kiitos Brewing, a one-year-old Utah brewery that makes green or environmentally responsible beer. Kiitos is the only brewery in the state with a High-Efficiency Brewing System or HEBS, that uses 40 percent less water and 15-20 percent less grain. Thursday July 26, 2018 in Salt Lake City. 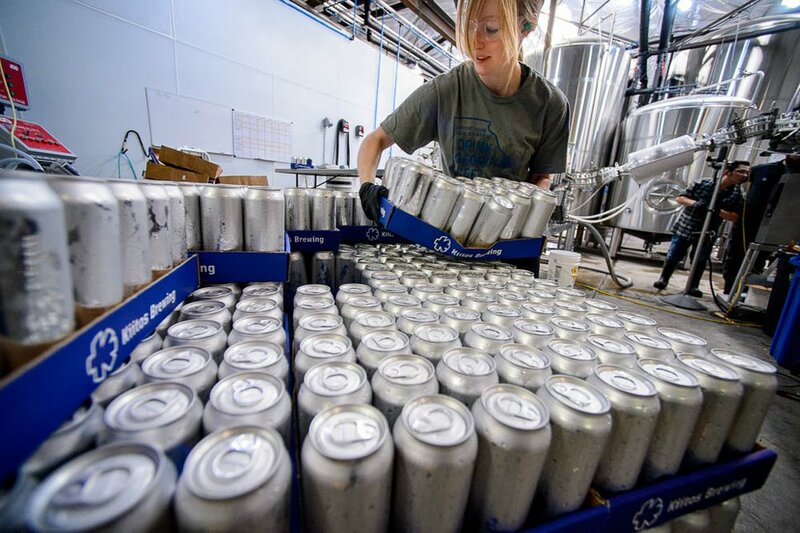 (Trent Nelson | The Salt Lake Tribune) Rachel Bell Belton at Kiitos Brewing, a one-year-old Utah brewery that makes green or environmentally responsible beer. Kiitos is the only brewery in the state with a High-Efficiency Brewing System or HEBS, that uses 40 percent less water and 15-20 percent less grain. Thursday July 26, 2018 in Salt Lake City. (Trent Nelson | The Salt Lake Tribune) Head brewer Clay Turnbow at Kiitos Brewing, a one-year-old Utah brewery that makes green or environmentally responsible beer. Kiitos is the only brewery in the state with a High-Efficiency Brewing System or HEBS, that uses 40 percent less water and 15-20 percent less grain. Thursday July 26, 2018 in Salt Lake City. (Trent Nelson | The Salt Lake Tribune) Eddie Landa at Kiitos Brewing, a one-year-old Utah brewery that makes green or environmentally responsible beer. Kiitos is the only brewery in the state with a High-Efficiency Brewing System or HEBS, that uses 40 percent less water and 15-20 percent less grain. Thursday July 26, 2018 in Salt Lake City. (Trent Nelson | The Salt Lake Tribune) Eddie Landa at Kiitos Brewing, a one-year-old Utah brewery that makes green or environmentally responsible beer. Kiitos is the only brewery in the state with a High-Efficiency Brewing System or HEBS, that uses 40 percent less water and 15-20 percent less grain. Thursday July 26, 2018 in Salt Lake City. (Trent Nelson | The Salt Lake Tribune) Kiitos Brewing, a one-year-old Utah brewery that makes green or environmentally responsible beer. Kiitos is the only brewery in the state with a High-Efficiency Brewing System or HEBS, that uses 40 percent less water and 15-20 percent less grain. Thursday July 26, 2018 in Salt Lake City. Leaving a light footprint is one of the reasons the 10-month-old brewery was The Salt Lake Tribune Editors' Choice during the second annual Food Truck and Brewery Battle at The Gateway. Shades of Pale won the People’s Choice award in the beer category. Kiitos' beer lineup — from traditional ales to an aged coconut stout to a blackberry sour made with real fruit — is another reason the business and its head brewer, Clay Turnbow, stand out. Kiitos sells beer that is 4 percent alcohol by volume (aka 3.2 beer) in grocery stores and by the glass at its tap room, 608 W. 700 South. Several of its higher-alcohol options are available in state-owned liquor stores and at its on-site beer store. Efficient brewing • The brewery has a High Efficiency Brewing System, or HEBS, which uses a mash press to extract liquid from the malted barley. The system speeds up the brewing process, requiring less energy and people power. It uses 30 percent to 40 percent less water than traditional systems and 15 percent to 20 percent fewer grains. Kiitos is one of only 18 craft brewers in the country to have the system, and the only one in Utah. pH-balanced • A three-step system produces pH-balanced wastewater before it goes into the city drainage system. Other breweries have to add chemicals to get the right balance. (Trent Nelson | The Salt Lake Tribune) Head brewer Clay Turnbow and Eddie Landa at Kiitos Brewing, a 1-year-old Utah brewery that is the only brewery in the state with a High-Efficiency Brewing System, or HEBS, which uses 40 percent less water and 15 percent to 20 percent less grain. Thursday, July 26, 2018, in Salt Lake City. Aluminum cans • Kiitos packages all its products in blue aluminum cans, which are easily recycled and require less energy to produce. It’s also better for the beer. The cans protect it from sunlight. Sustainable feed • The spent grain from the brewing process is taken to the East African Refugee Goat Project farm in west Salt Lake City, where it is mixed with feed and offers a high-protein, high-fiber meal for the farm animals. Giving back • Each month Kiitos creates a limited-release beer that is available on draft only in its tap room. For each $5 pint glass sold from the “give back handle,” $1 is donated to an area charity. In June, sales of its Big Gay Ale benefited the Salt Lake Pride Center; in July, proceeds from the Kiito-rita, a version of the pilsner with lime and salt, went to the American Civil Liberties Union. Even the brewery name, pronounced “kee-tose,” has a backstory. It means “thank you” or “gratitude" and is a nod to Dasenbock’s Finnish heritage. Brewing beer with a conscience doesn’t come cheap, according to Dasenbrock, a Utah native who got bored with his job as an information technology consultant and sold a portion of his company to get funds to launch the brewery. 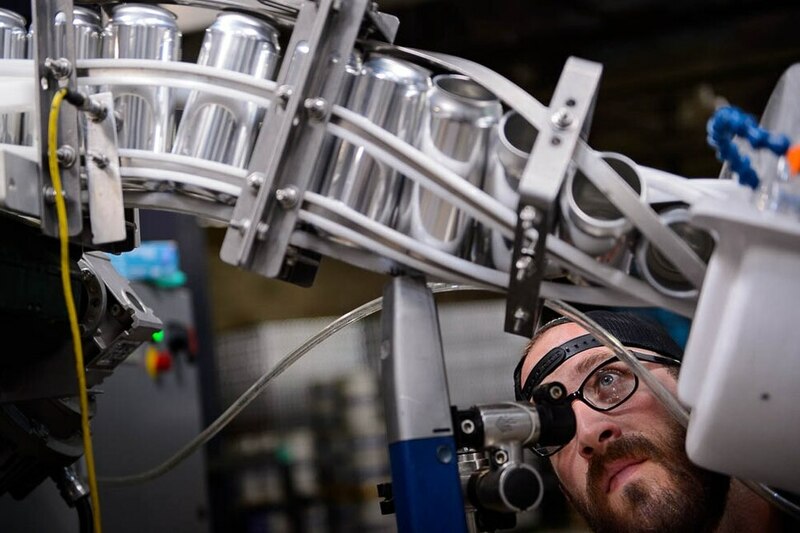 He also brought on several investors, which is fortunate, since construction delays and governmental red tape with Salt Lake City meant the price to open the brewery went over budget and it opened months behind schedule. (Trent Nelson | The Salt Lake Tribune) Rachel Bell Belton at Kiitos Brewing, a 1-year-old Utah brewery that makes "green" or environmentally responsible beer. Kiitos is the only brewery in the state with a High-Efficiency Brewing System, or HEBS, which uses 40 percent less water and 15 percent to 20 percent less grain. Thursday, July 26, 2018, in Salt Lake City. 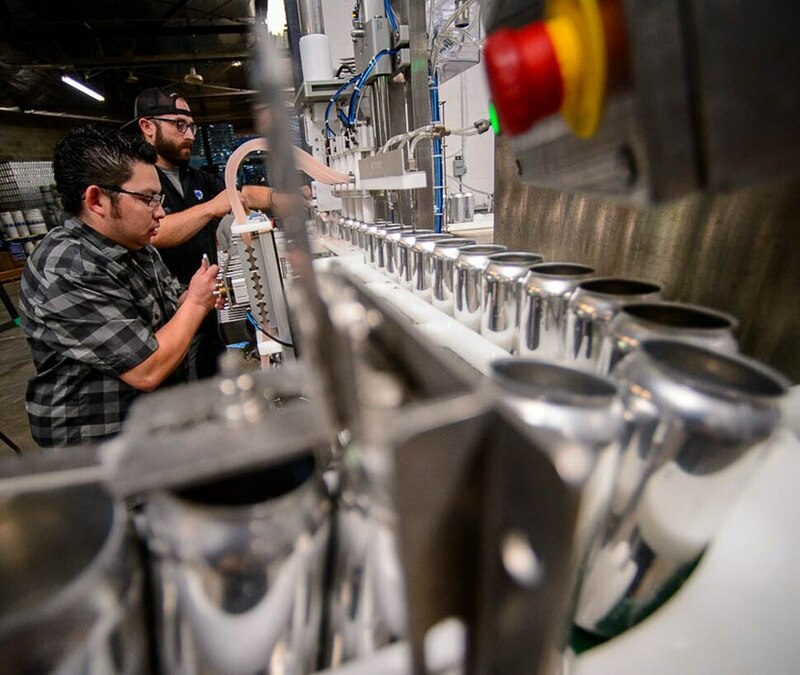 Still, a large number of craft beer consumers are “environmentally driven,” so it makes sense that more craft brewers are creating that type of business.